Calvin Borel, the jockey from nearby St. Martin Parish, rode at the bush tracks and farms throughout South Central Louisiana before starting his pari-mutual career at Delta Downs in 1982. With his down home country boy manner and unbridled enthusiasm for his mounts and his fans, Borel has crossed over to become a true household name in sports after more than a quarter-century in the saddle that has seen him land in the winner's circle almost 5,000 times and rack up purse earnings of more than $125 million dollars. Nominated to and a winner of several horse racing and sports themed awards, Borel stated "this award is special to me as it is based on one of horse racing's highest achievements (winning the Kentucky Derby) and is named for one of the all-time great riders and one of my personal heroes, Bill Hartack." 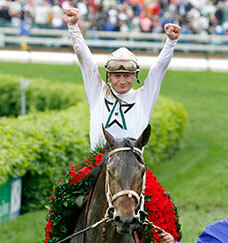 Borel won the Kentucky Derby in 2007 aboard Street Sense and again in 2009 on Mine That Bird. 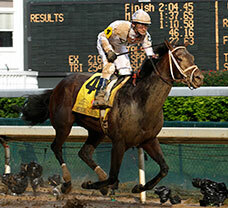 The 2009 win was an especially momentous occasion in Thoroughbred racing as Borel rode Mine That Bird to victory despite 50-1 odds, the second-longest shot to win in Kentucky Derby history. "Calvin is one of the most highly admired jockeys in today's racing industry," said Michael Stidham, Fair Grounds-based horse trainer and founding member of the Bill Hartack Charitable Foundation.